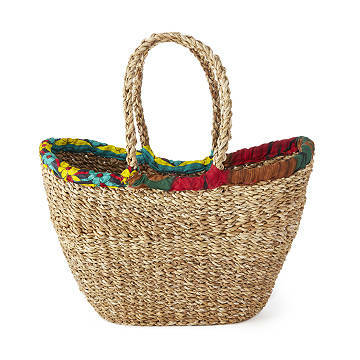 This hand-woven seagrass bag is roomy and tough enough for your summer beach and farmer’s market hauls. Enough citrus for a summer's worth of sippin'. Or everything the family needs for a day at the beach. That's how much we think this basket bag can carry. (Just a theory, but we'd love to test it.) Made of natural seagrass, with a colorful, upcycled sari accent, it's super sturdy and can handle the heaviest farmer's market hauls. The bottom's flat, so it won't tip over when you set it down to inspect the sweet corn. Due to the upcycled nature of the sari material, expect variations in colors and patterns. Hand-woven in India by artisans earning a decent living.